This is a new, completely revised, updated and enlarged edition of the author's Ergebnisse vol. 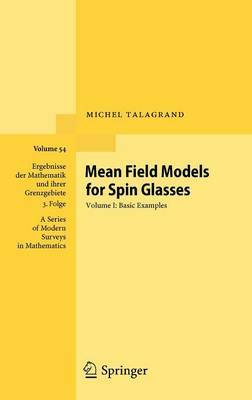 46: "Spin Glasses: A Challenge for Mathematicians". This new edition will appear in two volumes, the present first volume presents the basic results and methods, the second volume is expected to appear in 2011. In the eighties, a group of theoretical physicists introduced several models for certain disordered systems, called "spin glasses". These models are simple and rather canonical random structures, of considerable interest for several branches of science (statistical physics, neural networks and computer science). The physicists studied them by non-rigorous methods and predicted spectacular behaviors. This book introduces in a rigorous manner this exciting new area to the mathematically minded reader. It requires no knowledge whatsoever of any physics. The first volume of this new and completely rewritten edition presents six fundamental models and the basic techniques to study them.